There is no clear best choice or ‘standard’ when it comes to a pool apron in terms of dimension or material. Most of the decision will be based on what you like and what your budget is. In most cases pool owners have a good idea of what they want to have around their pool because they want to match what they already have or because of past experiences with a particular material. As you think about how you want to create your back yard pool and apron, it’s important to keep a couple other things in mind. 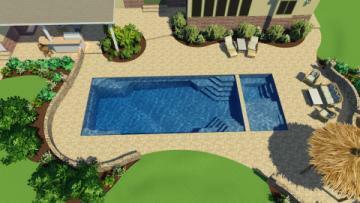 First- is an automatic pool cover going to be part of the design? If it is then you have some flexibility in terms of how small your apron can be. In fact if you would like no apron at all on one or two sides that is quite possible with an auto cover system. If you are not going to have an automatic safety cover incorporated into the pool then a ‘trampoline’ style or winter safety cover is probably the route you will go. These seasonal covers need, in most cases, three feet or more for an ideal installation. Though they can be installed with less than three feet they will sometimes need to be anchored beyond the apron in the yard or adjacent bed. This is accomplished by using yard stake anchors.Learn more about the apron space needed for winter covers. The second deciding factor is what space will you really need to create. One of the mistakes we see pool owners get into is recreating space. If you have an outdoor living area that includes a dining area, grill area, and adequate seating then perhaps you are not going to need any more apron than what will be necessary to get around the pool. Tying the space together tastefully can be tricky but worth the effort. On the other hand if you have a minimal amount to start then perhaps taking out what’s there now and creating an all new seamless space makes more sense. The last consideration, and perhaps the biggest, is the material. If you have an existing material now- do you match it? Though matching seems like the most obvious it’s not always necessary. Separate materials can add a hint of separation and provide definition between spaces. It is also in most cases better NOT to match an existing material and come up short. A close match often times comes up looking worse than not trying at all.